No. 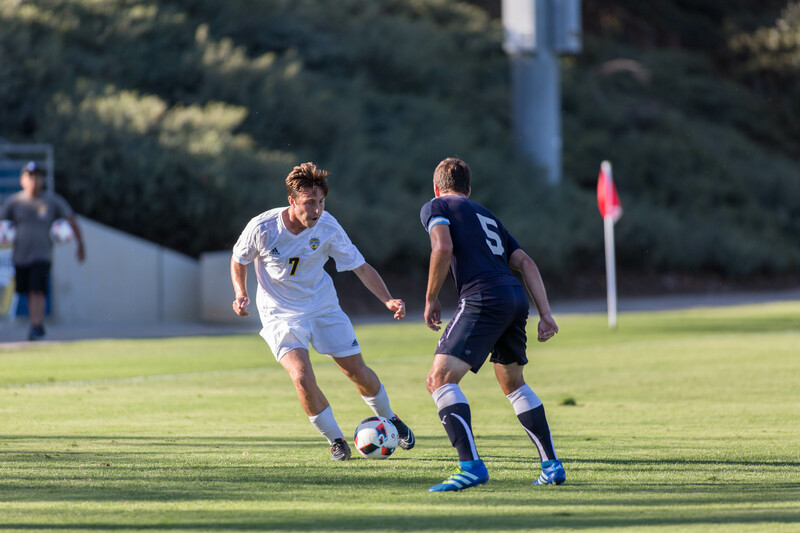 10 UCSD faced a familiar foe on Friday night at Triton Stadium when the team took on Cal Poly Pomona in the NCAA Tournament’s third round. The two teams were at a deadlock throughout the game, and UCSD needed overtime to dispose of the Broncos. The most successful team in UCSD’s Division II history now advances to the national quarterfinal as the West Region champs, where it faced No. 11 Midwestern State. The top seed in its part of the NCAA bracket, UCSD was hosting the third round, looking to continue its “road to KC.” In the team’s way stood Cal Poly Pomona, a fierce opponent which also happened to be last year’s West Region champion and national runner-up. With the 1–0 win in overtime and in front of 703 spectators, the Tritons brought their record to 18–2–2 for the season and remained undefeated at home. The contest was hard-fought and balanced till the end, with CPP holding a slight 16–15 advantage in shots. Two defensive-minded teams, the Tritons and the Broncos are ranked second and seventh, respectively, nationally in goals against average. The festivities really began in the 36th minute, when senior midfielder Nick Palano and sophomore midfielder Christian Cordell helped set up a shot by senior midfielder Riley Harbour that Broncos junior goalkeeper Jason Trejos caught with ease. CPP responded a few minutes later when junior midfielder Sergi Monso missed the goal by a few inches to the left. In the second half, Monso procured himself another chance with a big shot from outside the box that floated in the air until McElfresh got to it. Monso was at the origin of another goal opportunity for the Broncos when he crossed the ball in with 19 minutes remaining, but junior forward Luis Najera Jr., who was at the receiving end of the cross, failed to convert in front of McElfresh. UCSD had one last chance in regulation, when junior forward Uly de la Cal crossed the ball in from the right side, but Harbour just missed the ball in the box. It took the Tritons only four minutes in overtime to force a decision for the game. Redshirt sophomore right back Jeff Powers passed to junior winger Zachary Lagotta down the right side. Lagotta took the ball and crossed it in toward Harbour, who was flanked by the opponent’s defenders senior Rubik Zazian and junior William Johnson Des Bordes. The ball went by Trejos, and with Harbour putting pressure, it was deviated by Zazian into his own goal to send UCSD through to the next round. Trejos compiled six saves for CPP, while McElfresh, the reigning California Collegiate Athletic Association defensive player of the year, had five for his 13th clean sheet of 2016. UCSD now rides into the national quarterfinals on the back of 10 consecutive home shutouts and looks to advance to the Final Four. “We’re gonna come out and play soccer, and if we can show what we showed today we’ll be able to play soccer into the next month,” McElfresh said.